These "custom fit" floor mats are designed to fit your front, 2nd, and 3rd seat floor areas as well as your trunk and cargo spaces… like a glove. We make our custom fit floor mats with a patented rubberized thermo-plastic material that we guarantee not to crack or break. The Husky Liners Floor Liners form-fit design and raised embossing keep spills on the floor mat and your feet out of the mess. 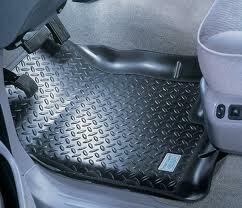 Our custom fit floor mat style Floor Liners will keep your carpet looking brand new for the life of your vehicle. Not just guaranteed for 3 years… guaranteed for life.